WebManager window stickers and buyers’ guides are available in versatile designs that address auto buyers’ biggest concerns and make comparison shopping much easier. If you’re a DeskManager user, you can import data directly into WebManager to create your window stickers. Otherwise, keying in a VIN unlocks tons of basic vehicle data, which can be bolstered with selling points you’d like to highlight. Once the vehicle is in the system, you can finalize certain details such as the mileage, color and service history. WebManager’s real-time preview ability lets you check the appearance of your final product at every step along the way. 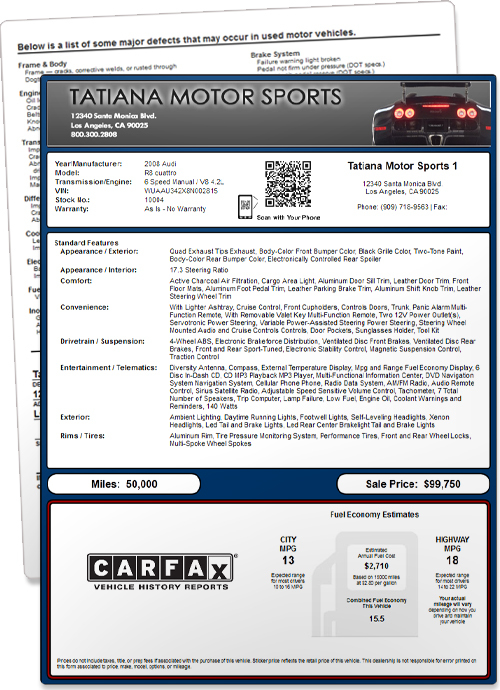 Print out thorough, foldable buyers guides for each vehicle by selecting the applicable warranty type from a drop-down menu.